For other uses, see Gown (disambiguation). For a brief history of the gown, see Clothing terminology. An evening gown is a long flowing women's dress or gown usually worn to a formal affair. It ranges from tea and ballerina to full-length. Evening gowns are usually made of luxurious fabrics such as chiffon, velvet, satin, organza, etc. Silk is a popular fibre for many evening gowns. Although the terms are used interchangeably, ball gowns and evening gowns differ in that a ball gown will always have a full skirt and a fitted bodice; in contrast, an evening gown can be any silhouette—sheath, mermaid, A-line or trumpet shaped—and may have an empire or dropped waist. It corresponds to both men's semi-formal wear for black tie events and men's formal wear for white tie events. Evening wear, sometimes also known as court dress based on its creation at royal courts, for women has its origins in the 15th century with the rise of the Burgundian court and its fashionable and fashion-conscious ruler Philip the Good. Wool, in various weaves, was the most dominant fabric for dresses, and the ladies of the court often simply added a train to their kirtle for formal occasions. Rich fabrics and fibres were usually the domain of the nobility, and clothing was still used as an identifier of social rank and status. The dawn of the Renaissance slowly changed the rigid social rank system, and allowed wealthy Patricians and merchants to visibly display their success. The art of weaving silk was firmly established in the Mediterranean around 1400, and as a result, silk weaves became fashionable for those who could afford them. Dresses for court balls and similar festivities were often made of intricately woven silk and trimmed with expensive furs to highlight the wearer's social status. The vibrant court life of the 16th and 17th centuries with its focus on art, literature and music created a fertile environment for feminine formal clothing. Elaborate dinners, dances, and theatre productions allowed fashionable ladies to showcase their finery. The Italian Renaissance courts were the pinnacle of style and elegance in Europe. With the advent of the Baroque era, the focus began to shift to France and the court of Louis XIV. 17th century court dresses featured draped skirts with long trains, tight bodices, low necklines trimmed with lace, and embroidered, lace- and-ribbon-trimmed full sleeves. Rich silk weaves, such as satin, taffeta and velvet created luxurious gowns. In the 18th century, formal dress started as the mantua, but later developed into the elaborate sack-back gown. The farthingale so popular during the 16th/17th centuries, evolved into the pannier to give dresses and skirts extra volume and the desired court silhouette. During this entire period, a ball or evening dress was synonymous with court dress, as balls took place at court or in the palaces and salons of the nobility who copied the latest fashions at the courts. Starting with the late 18th century, the term "evening or ball gown" emerged, as balls and formal dances were no longer the sole domain of royals and aristocrats. The French Revolution had caused social upheaval, and firmly cemented the place of upper-middle and upper class citizens in society. A common silhouette for evening wear, just as for day wear, was the high-waisted Empire or Regency dress. Evening versions featured lower necklines, short sleeves and elaborate fabrics and embroidery. Evening styles changed dramatically during the 19th century, and evolved from the relatively simple classically inspired lines of the early decades to progressively fuller skirts and, at times, sleeves (1830s and 1840s). The styles ranged from having huge sleeves in the 1830s, to off-the-shoulder and with wide flounces in the 1840s, to very low-necked in the 1850s, to having low necklines and short sleeves in the 1860s, to long and lean with a bustle and very short sleeves in the 1870s, to sleeveless, low-necked, and worn with gloves in the 1880s, to having a squared decolletage, a wasp-waist cut, and skirts with long trains in the 1890s. The 19th century distinguished between relatively high-necked dinner gowns for formal dinners and soirees, evening gowns for dances and theatre events, and ball gowns for the most formal affairs including balls and the opera. During the Edwardian era, or Belle Epoque, the s-shaped figure was fashionable, which included a very narrow waist. Immediately preceding and during World War I, lines became looser and more fluid as a precursor to the boyish silhouettes of the 1920s. Later, in the 1920s, the hemlines of evening gowns rose and cuts were very simple to match the new life style of the Flapper era. The 1930s introduced bias cuts and artificial fibres. Along with the Empire cut, over the years the sheath, mermaid, A-line, and trumpet shapes became popular. Also, the dropped waist and princess styles were popular, depending on the era. Grace Kelly is noted for wearing understated evening gowns. Today, the evening gown comes in different silhouettes and even lengths, but the full-skirted ball gown remains the pinnacle of formality. Evening gowns are worn at various semi-formal black-tie (and sometimes white tie) functions, including formal dinners, opera and theatre premieres, formal dances, evening wedding receptions, and charity balls. When worn to white tie occasions, the evening gown is generally more elaborate than when worn to black tie occasions. For example, the silhouette will be fuller, to match with the "very formal" white tie attire by men. 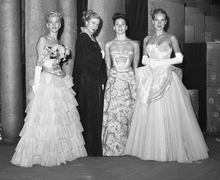 In the modern times, the evening gown is becoming more frequent in women's formal wear, even at white tie occasions, but etiquette states that ball gowns must be worn. Also, evening gowns gained prominence in beauty pageants, be it national or international. Judges in the beauty pageants score the contestants in the evening gown segment, the highest of which is propelled in the Top 5. Most pageants offer awards such as "Best in Evening Gown" to the contestants with the most beautiful evening gowns. Usually, the crowning moment shows the winner and the rest of the pageant contestants in evening gowns. Evening gowns can range from tea length (mid-calf to ankle-length) to full-length (to the floor). In general, the same rules of a white tie event apply to a black tie event, although in some cases a cocktail dress is acceptable. However, women usually wear evening gowns to black-tie occasions. The sheath style evening gown, like the usual sheath dress, is designed to fit the body tightly. It is generally unbelted, and has a straight drape. It can have shoulder straps or be strapless. Mermaid, as the name suggests, means that the evening gown is shaped like a mermaid. It is form-fitting at the bodice, and the skirt is designed to resemble a mermaid's tail in silhouette. The skirt may or may not be of the same colour or texture. The A-line style evening gown is somewhat bell-shaped, it is close-fitting at the top and widens gradually at the bottom, without gathers or pleats. This makes for a simple but elegant appearance. If the evening gown is trumpet shaped, it is tight-fitting until it reaches the knees, where it flares. The Empire silhouette involves the waistline coming up to just below the bust, from which the skirt hangs straight and loose, in a simple breezy style. The waistline is dropped below the actual waistline. The skirt can be fitted or flared. The princess style evening gown is also tight, cut in single pieces, such as gores, and hanging in an unbroken line from shoulder to flared hem. Evening gowns can be distinguished from conventional or day dresses by two primary features. The first is the cut, which tends to be couture and in line with the latest fashions, unless the article of clothing is a ball gown, in which case it will tend to be cut along more classic lines. The second distinguishing feature is the fabric. Evening gowns tend to use luxury materials such as silk, velvet, and taffeta, and they may be richly embroidered or decorated with beads, sequins, jewels, and other ornaments. Wealthy women also prefer to purchase tailored evening gowns, which are designed to flatter their figures. In all cases, evening gowns are designed to be worn with high quality jewellery. 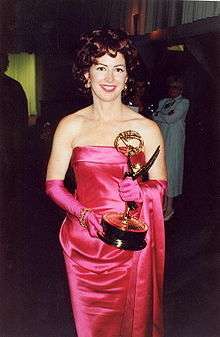 Evening gowns are typically associated with glamour and luxury, and appear at events like the Academy Awards in the United States, the opening of the society season in urban areas, and formal receptions. In most instances, evening gowns are not designed to be worn more than once, although high profile members of society such as celebrities may auction off gowns which they have worn for charity. In some cases, especially for highly public events, well known designers will lend custom or vintage dresses to famous attendees of the event, in order to showcase their design skills, and then take the evening gowns back at the end of the evening for part of a permanent archive. In the 1940s, couturiers introduced dancing costumes, a party dress with a full skirt specifically made for semi-formal and formal dances. The dancing costume was shorter than the evening gown. A ball skirt is a variant fashion which resurfaced in the 1990s, consisting of a full, long skirt that can be worn with a cashmere sweater, lace camisole, or other dressy top.